“As a deputy commissioner for the ICC, Alan Decker’s job is to make sure the settlements on LV178 follow all the rules, keeping the colonists safe. But the planet known as New Galveston holds secrets, lurking deep beneath the toxic sands dubbed the Sea of Sorrows. The Weyland-Yutani Corporation has secrets of its own, as Decker discovers when he is forced to join a team of mercenaries sent to investigate an ancient excavation. Somewhere in that long-forgotten dig lies the thing the company wants most in the universe—a living Xenomorph. The second of Titan’s new Alien trilogy, Alien – Sea of Sorrows, is written by James A Moore and is bizarrely set over 200 years after Out of the Shadows. “Why would a sequel after its predecessor be weird?” I hear you ask. This is due to the fact that the third (and currently final) book is set during Aliens, centuries prior to this novel. It just struck me as an odd chronological placement. The novel itself is very much a direct sequel to Tim Lebbon’s previous novel and goes to show that this trilogy has is establishing a brand new coherent continuity. What stood out to me as I read the opening third of the novel was just how much that reminded me of the older novels. Rather than the self contained nature of the majority of DH Press’ last line of Alien novels, Sea of Sorrows felt a part of a bigger whole. Something I really liked was that Jim Moore took it very slow to build up the action. The first half of the book was devoted almost entirely to the development of Alan Decker, the main character and the world in which he lived. The world building that Jim did in this novel was fantastic. The ICC, who Decker works for, was mentioned previously in Aliens but never really dealt with. Jim gave them further attention and looked into them somewhat. As Weyland-Yutani makes a return in the novel he also dealt with their return to power. I was somewhat worried that this would be a little convenient but considering how the films always portrayed them as an omnipotent presence, the way Jim brings them back felt believable and further developed this unexplored period in the Alien timeline. I was surprised at how much I liked Alan Decker. As I mentioned, Jim spent much of the earlier parts of the novel developing him and letting us get to know his family, his mentality and the world he lived in. It really helped me believe in his plight and his motivation throughout the novel. Something that was worrisome going into the novel was how Jim Moore would present Alan Decker’s connection to the Aliens and thankfully it was dealt with tactfully and not over the top. Jim wrote Decker as empathic – this means he could sense the emotions of others. Now if you’re going into this novel having not read any of the old Expanded Universe this might seem slightly off track for Alien. However, as far back as Aliens Book 1 (Outbreak), the Queens were able to influence humans via some form of telepathy. Jim Moore doesn’t have Decker reading the minds of the Alien, he has Decker sensing something incomprehensible from the Aliens that he can only interpret as rage and vengeance. If you’re familiar with the synopsis of Sea of Sorrows then you should know that the Aliens are after Decker for his relation to Ripley. This is something that could be of concern to some fans coming into this novel. Following the events of Out of the Shadows, the Aliens “marked” Ripley’s bloodline. Jim doesn’t actually go into the specifics of it, only that they are able to sense his relation to Ripley. This really didn’t strike me as anything negative. We know for a fact that some insects in reality are capable of “marking” targets – the Japanese Giant Hornet springs to mind. So combined with the genetic memory of the Aliens and their completely…well…alien-nature, I can quite easily believe that the Aliens were able to genetically identify Ripley’s bloodline. Jim Moore splits his characters into three distinctive groups. We have a small group of main characters of which Decker is obviously a part of. After him we have Manning. Manning is the leader of the mercenaries that make up the bulk of the characters in the book and provide us with our action elements. Both Decker and the reader have ample reason to hate Manning as you’ll find out when you read the novel. However, Jim Moore infuses his personality with enough badass and lets us understand him that it’s quite easy to forget what he did to Decker and just enjoy the ride. He’s shown to be quite the leader and I really enjoyed reading about him. After Manning we have Adams, another merc, who forms an attachment to Decker. She was quite likeable and down to Earth, helping guide Decker (and us) through this new future we had found ourselves in. Her and Decker’s interactions were great and the pair carry a very believable relationship. The last of our main characters is Rollins. Her character’s personality is very obviously based on Vickers from Prometheus and it’s easy to see this in every scene she is in. Her motivation is also quite a-typical of the older “get Alien specimen” stories and this lack of originality that makes her the most boring. After this main core group, we have a similar number of secondary characters who are all given small but substantial attention. Many of these secondary characters are presented to be quite likeable and charming, must in the same way as how Aliens presented its secondary characters. I’m not going to spend too much space talking about these but I will throw a special mention out there to Piotrowicz. Like with Manning, we have plenty of reasons to dislike Piotrowicz but Jim Moore handles him in such a way that it’s easy to forget his involvement. He is written as quite a charming, almost Hudson-like (pre-freak out) kind of character. His last scenes in particular are fantastic. Jim Moore poses with his camera hungry friend. And lastly we get to the tertiary characters, of which Sea of Sorrows has plenty. Which makes sense. There’s an entire platoon of mercenaries, a whole terraforming expedition, plenty of scientists. Many of these pop-up for a mention, disappear and some reappear later on. They also play a part in the one major complaint I have in regards to the novel. Towards the middle of the book, when they finally encounter the Aliens, the pacing just grinds to a stop. One bunch of tertiary characters will encounter the Alien, figure something out and then die. Rinse and repeat for another few chapters. The book had been flowing quite well up until that point. Jim had kept it moving, using short chapters to keep the pages turning and never letting himself get bogged down. But once we hit the first encounters, it just stopped. The start-stop nature of these chapters pulled me out of the novel. I understand that these books need to be accessible to readers who might not be as familiar with the films as the fans but I thought Jim had written himself out of this problem much earlier on in the novel. There’s a section on board the mercenary ship were the characters are being briefed on the Aliens but apparently not thoroughly enough. Had Jim just put all the necessary information here, we could have just kept moving along. I was also disappointed to not explore the ship or the city in any meaningful way. Despite being back on LV178, we weren’t treated to any further development of the previous inhabitants or their mysterious leftovers. Considering how well Jim Moore had put into his world building of the post Alien Resurrection universe, this lack of exploration was disappointing. One last concern that fans might have about the novel is that Jim explores a little with the “hivemind”. They’re short sections in which the Aliens are presented as an appropriately individual-less mind. He did nothing to offend any fans and one section later on – in which a Queen “communicates” via telepathy to Decker – is a nice touch that adds some more concrete intelligence to the Aliens. 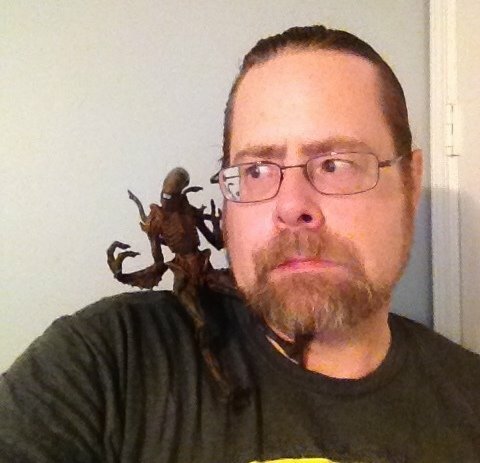 Jim Moore handles the Aliens with respect, not treating them like the bugs many do. He continues Tim Lebbon’s raptor-like approach. However, as this novel is more akin to Aliens, we do need shooting and we do need to be able to kill them. And to that without disrespecting the Aliens, Jim has his mercenaries packing plasma rifles – the power of the sun in your hands. Very dangerous stuff; and something I can easily believe is capable of killing Aliens (and anything that gets in the way). He did actually trip over himself and have random rifles be called pulse rifles which did get distracting at times. This is a very ridiculous complaint but Sea of Sorrows is a completely different size to Out of the Shadows. Thish annoyed me slightly as it meant they didn’t fit together nicely on the shelf. 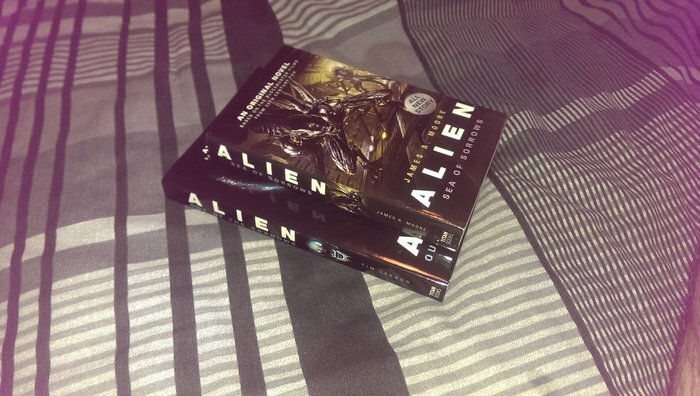 Noticeable size difference between the 2 novels. The continuity between Out of the Shadows and the effort Jim Moore put into his early world-building really helped make this novel feel part of a bigger whole, a feeling the Alien novels have been missing for years. The way in which the book concluded also gives the feeling of more to come which I find hopeful for a more organized continuity for Titan’s Alien novels. However, with only one more on the horizon and with that book seemingly taking place during the infestation of Hadley’s Hope, I’m slightly worried we might not get to see the continuation of the story being setup by Jim Moore. Over all I really enjoyed Sea of Sorrows. It’s quite definitely an adventure/action piece, more akin to Aliens than Alien. His characters are fun, his inclusion of Decker’s connection to the Aliens and the minor dabbling into the Alien hivemind was fun to read and handled in a very tasteful manner. I would happily recommend picking this one up as it feels like a return to the glory days of old. However, the book didn’t explore the new extraterrestrials at all and the book plays out largely like one of the older novels, not really treading onto new ground. It seems as if the ending was built towards letting another novel play with the new elements later. From Corporal Hicks at AvPGalaxy, I award Alien – Sea of Sorrows with a 7.5 out of 10. Is Decker descended from Ellen Ripley herself or Ripley Clone 8? The book was confirmed to be set after “Resurrection”. Weyland-Yutani said that Decker had Ripley’s genes, so would the clone. I was pleasantly surprised how good of a read this book started as also. I couldn’t believe the character development that was given to Decker as opposed to the character development in Out of Shadows or some of the older novels. I also thought it seemed to start well but then not get too far in treading some new ground but this is the second book in this series and I thought maybe that was why. I’m sure James Moore could have made an even better book had it not been the middle book in the series. This book is the “Empire Strikes Back” of this book series chronologically and many other ways IMO.